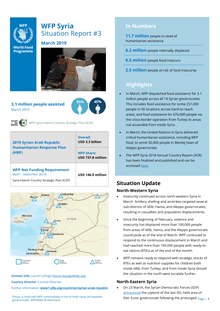 • In March, WFP dispatched food assistance for 3.1 million people across all 14 Syrian governorates. This includes food assistance for some 251,000 people in 56 locations across hard-to-reach areas, and food assistance for 676,000 people via the cross-border operation from Turkey to areas not accessible from inside Syria. • In March, the United Nations in Syria delivered critical humanitarian assistance, including WFP food, to some 50,000 people in Menbij town of Aleppo governorate. 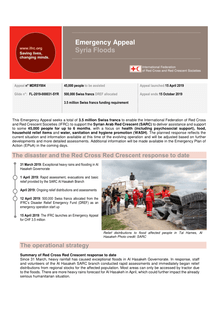 This Emergency Appeal seeks a total of 3.5 million Swiss francs to enable the International Federation of Red Cross and Red Crescent Societies (IFRC) to support the Syrian Arab Red Crescent (SARC) to deliver assistance and support to some 45,000 people for up to 6 months, with a focus on health (including psychosocial support), food, household relief items and water, sanitation and hygiene promotion (WASH). 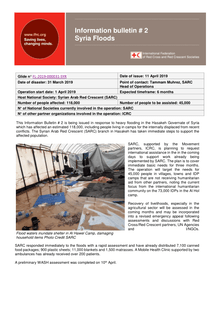 While responding to people affected by floods in southern rural Qamishli, the Syrian Arab Red Crescent volunteers of Hasakeh branch started distributing relief aid to the people affected by the stormy weather in Al-Hawl Camp on April 3rd, 2019. They have distributed them with 2.000 blankets, 1.500 mattresses, 500 canned food parcels, 100 plastic sheets and diapers for babies and adults provided by the ICRC. At the same time, the volunteers have installed additional 319 tents to shelter the people whose tents have been damaged. Heavy rainfall hit northern Syria over the weekend causing fatalities and flooding refugee camps. 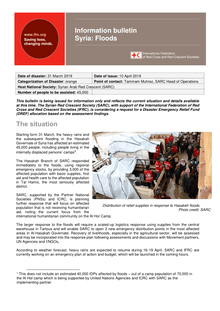 As of 4 April at 8.00 UTC, local media report two deaths in Al Hassakeh Province, while over 6 500 families across northern Syria have been affected. The Atma Camp (Idlib Province) was the most affected but several villages in Al Hassakeh Province have also been reportedly flooded. Moderate rainfall is forecast for Al Hassakeh Province in the next 24 hours. Geneva, Switzerland - Over 6,500 families were affected by the flooding this past weekend in Northern Syria as tents were swept away, and personal belongings were destroyed by the torrential rainfall. Many families were displaced again in search of a safe, dry place to live. The area was already overcrowded due to a recent influx of people escaping areas under bombardment. The Atma Camp was the most affected; over 40% of the area was swept away. 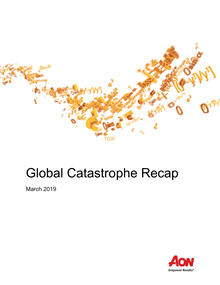 Thousands have lost everything. Exposure to illness has increased in the region.